In a medium bowl, mash the avocado with a fork. Add the red onion, kale, cilantro, tomatoes, lime juice and a pinch of salt and pepper. Stir and mash to combine and make guacamole. Layer the wonton wrappers on a flat surface. 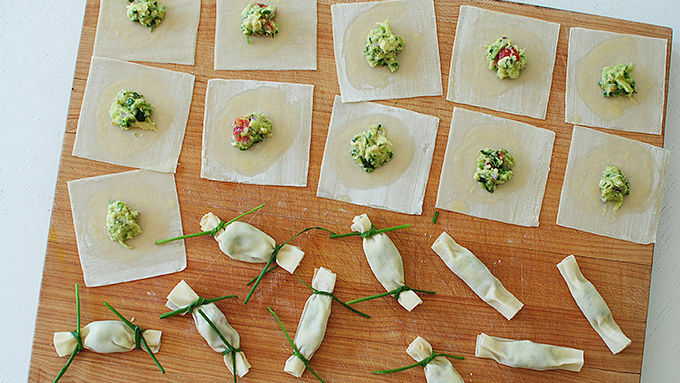 Beat the egg (creating a wash), and brush a circle in the center of each wrapper with a little wash. Dollop a teaspoon or so of guacamole in the center of each wonton, then roll it up, pinching the edges. Tie each end with a chive. Don't tie too tight or the chive will break. In the meantime, heat the oil until a wooden stick sizzles when you dip into it. That's when you know the oil is ready. Gently drop 5 at a time into the oil and fry until golden brown all over. Remove those and continue to fry the remaining wontons in batches until all are cooked and golden. Drain on paper towels. Serve immediately. The kale adds an earthiness to the guacamole. If it's not your thing, feel free to leave it out. 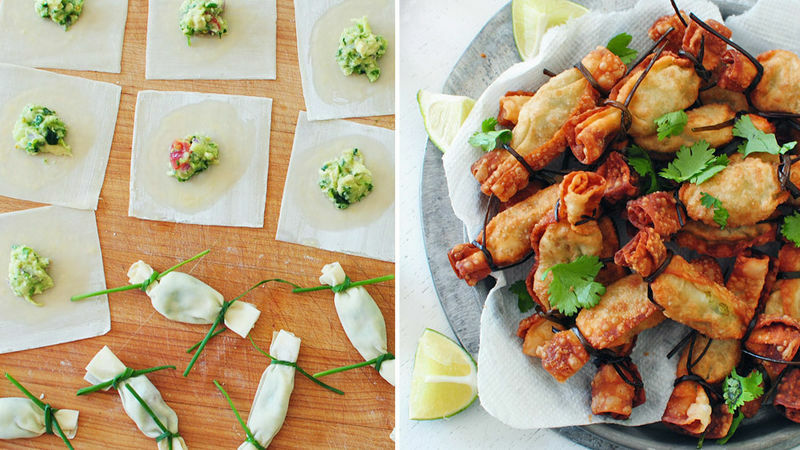 Kale-kissed gaucamole wrapped in wontons and fried? Where do I sign? Okay, this incredible appetizer is such an oxymoron. The happiest oxymoron ever. 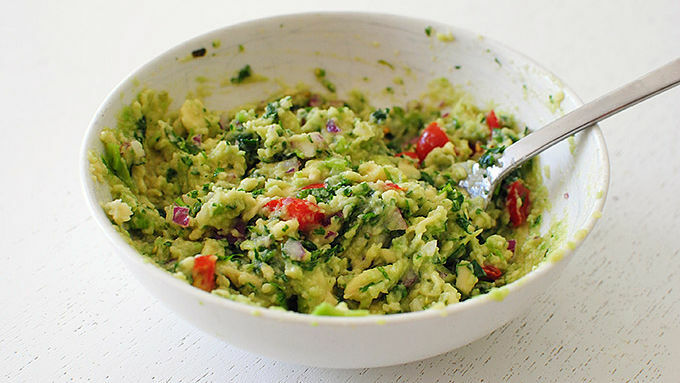 We've got guacamole with kale in it. 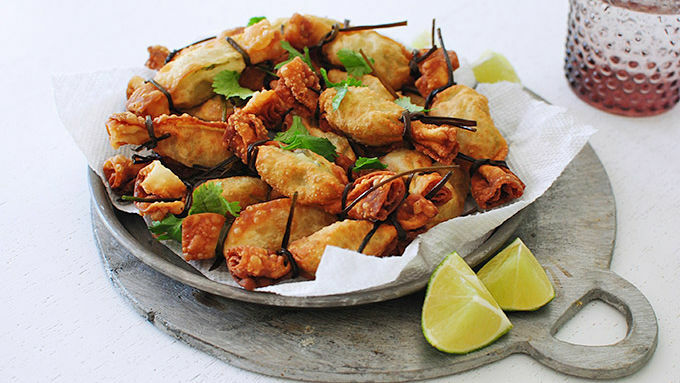 But then you wrap it all in wontons and deep fry them. It's called balance. It's just like me listening to NPR everyday and then watching Keeping Up With the Kardashians on the weekends. Balance. Don't roll your eyes. The magical Joy created these little suckers a while back, but I tweaked them juuuust a tad by adding kale to the mix, and using chives as the strings. They're just cute; I couldn't stand not to make them. And now it's your turn. BALANCE. The kale adds an earthiness to the guacamole. If it's not your thing, feel free to leave it out. Look how fun they are! Don't even think you'll have just one. But it's okay because, balance. Eat the whole tray.